In this installment of Conversations from Studio B, learn about the upcoming production of “Kiss Me Kate” coming to Stuart’s Opera House by way of the ABC Players. It’s 1948 in sultry Baltimore, and actor/producer/director Fred Graham is trying to get his new production of Shakespeare’s “The Taming of the Shrew” ready for opening night. Fred’s co-star and former wife, Lilli Vanessi, is angry because of Fred’s seeming infatuation with a new ingenue, Lois Lane. Lois’s boyfriend and fellow cast member, Bill Calhoun, has just lost $10,000 in a floating crap game, and has signed Fred’s name to an IOU in order to make it to the theater in time for the opening performance. The other cast members have the usual opening night jitters. To turn up the heat still further, two gangsters arrive at the theater to persuade Fred to pay up on the (unknown to them) forged IOU. Could anything else go wrong? Well, Lilli’s new fiancé, General Harrison Howell, might show up . . . .
Cole Porter’s jazzy tunes and memorable lyrics provide full scope for the musical talent of Chrissy Barkhurst-McKinney (Lilli), Esteban Vazquez (Fred), Samantha White (Lois), Devante Brown (Bill), and the part-doubling ensemble: Joe Balding, Caleb Bryant, Jenn Fritchley, Allie Harmon, Katie Herron, Jeremy Heyes, Zoie Lanning, Sydney Lewis, Aaron Mccabee, Dan Maccabee, Jodi MacNeal, Seth Mendel, Megan Molnar, Christine Neumann, Celeste Parsons, Chiara Ridpath, Sandra Russell, Jaclyn Sayers, and Ronni Smith. Audiences will recognize favorite tunes such as “Another Op’nin’, Another Show,” “So In Love,” Why Can’t You Behave,” Wunderbar,” “Always True to You, Darling in My Fashion,” and “Too Darn Hot.” Jenn Fritchley’s choreography sparks the numerous dance numbers. 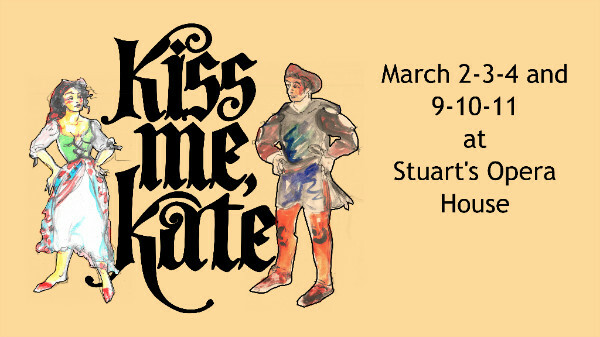 Kiss Me Kate will appear at Stuart’s Opera House in Nelsonville at 7:30 p.m. on March 2, 3, 9, and 10, and at 2 p.m. on March 4 and 11. Tickets are $12 for adults and $8 for students, and are available by calling 740-753-1924 or at www.stuartsoperahouse.org. Tickets can also be purchased at the door. Kiss Me, Kate is sponsored by the Hocking Valley Bank.